Striking Japanese Nautical of Singapore Strait. 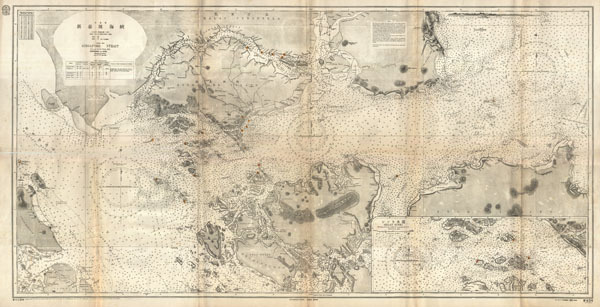 This is a rare and striking large format 1923 Japanese nautical chart of Singapore Strait. Centered on Singapore Island, this maritime map covers from Great Karimum Island in the west quadrant to Pulo Bintang in the east, it extends north as far as the Malay Peninsula and Jahore Strait and as far south as Pulo Bulan. Cartographically this map references 19th century British Admiralty charts of the same region with numerous updates to 1923. Throughout there is a wealth of practical information for the mariner, including notations on tides, anchorage, shipping lanes, and countless depth soundings in fathoms. Offers some inland detail particularly on Singapore Island and Singapore City. Most text is in English but there are also number of Japanese titles and annotations. Japanese Hydrographic Department stamps appear in the upper left margin and on the verso. Represents Hydrographic Department Chart no. 624. Good. Some toning on original fold lines. Japanese government stamps to margins. Professional reinforcement of folds on verso.